When the good team joined Marks & Spencer in London for their Christmas Press Show, one of the highlights was a cooking class with Marks & Spencer’s Development Chef, Jon Jones, held at L’atelier des Chefs Cooking School. 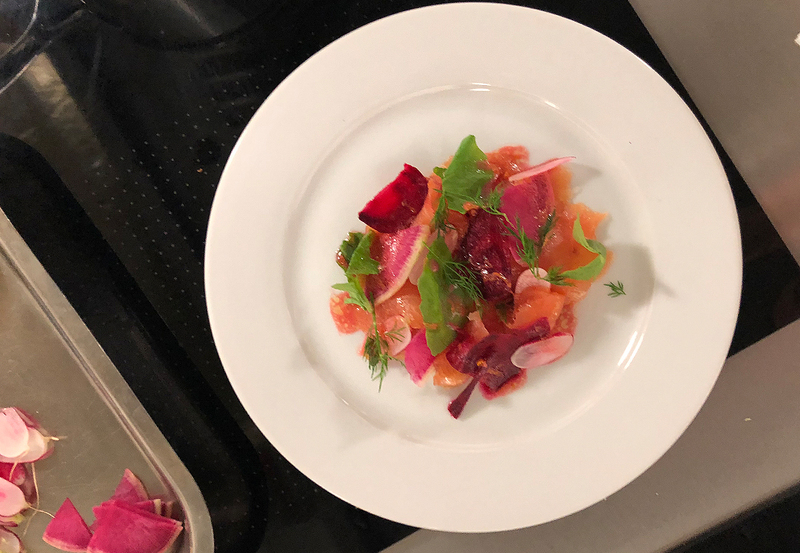 In keeping with the Marks & Spencer ethos of creating beautiful food, simply, Jon prepared a festive salmon salad with pickled beetroot and a tangy clementine dressing that would be ideal as a starter on Christmas Day. To help ease some of the stress of entertaining on the big day, you can prepare the salad three to four hours in advance, then dress it just before serving. Place the white wine vinegar, sugar and 200ml water in a small saucepan and stir over low heat until the sugar dissolves. Allow to cool. Using a mandoline or very sharp knife, thinly slice the beetroot into discs, then place in the pickling liquid and stand for 5 minutes until lightly pickled. Mix the clementine juice and zest with mustard and 1-2 tablespoons of the pickling liquid, then whisk in enough olive oil to form a loose, ‘cracked’ dressing. Season to taste with sea salt and freshly ground black pepper. To serve, arrange the smoked salmon on a platter or individual plates, then top with turnip, radish and drained beetroot slices, and garnish with reserved radish leaves and dill springs. Drizzle with the clementine dressing just before serving. For more festive recipes from Marks & Spencer, watch the Marks & Spencer Christmas video below or try Lyndsay Bettles Christmas recipes using premium ingredients from Marks & Spencer.